In a pot, melt the butter over medium heat. Next add the chopped green onions and garlic and sauté for two minutes. Add the frozen peas and continue cooking for three minutes. Add the tarragon and three tablespoons of water. Season with salt and pepper as desired. Cover the pot with a lid and let simmer over low heat for 25 minutes or until the peas are soft and creamy. If you don't have any tarragon, try using other herbs like basil or mint. This will give a different but delicioso sabor to your dish. Guisantes or cooked peas is a vegetable I often remember from the meals my mother and grandmother cooked. In Mexico, rice is generally served at least three times a week and typically comes with peas or chícharos, as they're also called back home. I really enjoy the color they give to a dish, as well as their sweet touch on the palate. Since this is one of the vegetables of the season, you can find them fresh in the market now. Whenever I see them I try to buy plenty, but I also always keep a bag of frozen peas ready in the freezer. This way when I'm short on time, I'm able to save a few minutes in the kitchen. Who doesn't like that? The recipe that I've noted here is simple, but full of sabor. 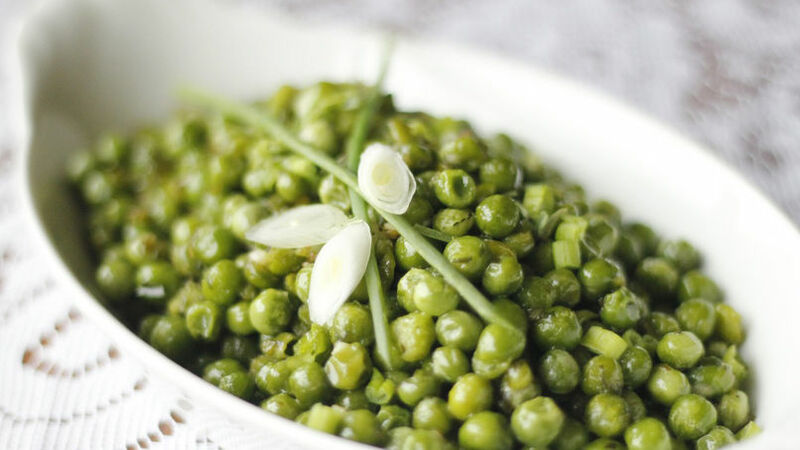 It combines three fantastic flavors–garlic, peas, butter–and makes the perfect accompaniment for roasted meat or fresh salads.